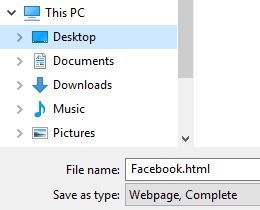 This tutorial will show you in a few simple steps how to create a website shortcut on your computer's desktop in Windows 7, 8 and 10 using your favorite web browser. You can use any web browser you want, like Google Chrome, Mozilla Firefox, Opera, Microsoft Edge, Internet Explorer or Safari. You can make an Internet shortcut for any website, such as Facebook, Twitter, YouTube, Yahoo, Tumblr, LinkedIn, Pinterest, or Reddit. You can also drag an Internet shortcut to the Windows taskbar to create a quick launch icon. This method works for almost all web browsers except Microsoft Edge. 1. Open your web browser (e.g., Google Chrome). 2. Open your favorite website or web page. 3. Minimize (resize) the web browser window, so that you can see both the web browser and desktop. 4. Go to the address bar of your web browser. 5. Drag the small icon lock, info or globe icon located next to the web address to the desktop. 1. Open your web browser (e.g., Firefox). 3. 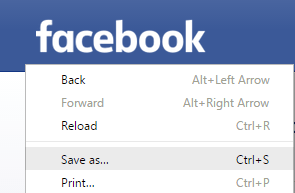 Right-click on the web page and choose Save as or Save Page As. Or press the [CTRL] + [S] keys on your keyboard. 5. At File name, you enter a name for the Internet shortcut. This method works for all web browsers. 1. Open your web browser (e.g., Opera). 3. Right-click on the web address located in the address bar of your web browser and choose Copy (Make sure that the web address is highlighted/selected). 4. Close or minimize the web browser window. 5. 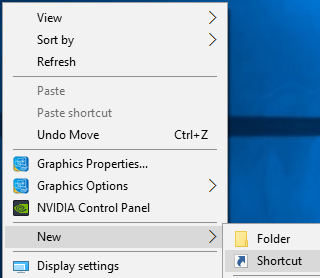 Right-click on the desktop, go to New and choose Shortcut. 6. Right-click on the location bar and choose Paste to copy the URL (web address) of your favorite site into the location bar. 8. Type a name for the Internet shortcut. 3. Click on the options button at the top right. 4. Go to More tools and choose Add to desktop. 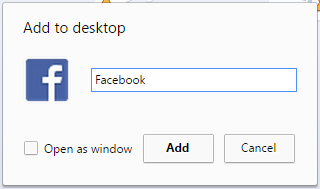 A Add to desktop window will appear. 5. You can edit or change the name for your Internet shortcut if you want. 6. Click on Add to save the shortcut. This method usually adds a nice icon to the shortcut. 1. Download an icon in .ico format. 2. Right-click on the shortcut on your desktop and choose Properties. 3. Click on Change Icon. 5. Select the icon you downloaded.